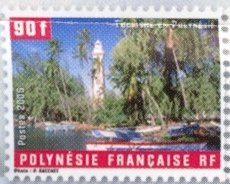 Pointe Venus Lighthouse sits at, you guessed it, Pointe Venus at the northernmost point of the island of Tahiti. The point takes it’s name because Capt. James Cook set up an observatory there to view the transit of Venus across the face of the sun, a very rare occurrence, in 1769. The lighthouse was completed in 1867 and went into service on the first day of 1868. It was refurbished and made higher in 1963. 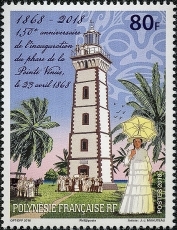 There are currently four stamps featuring the lighthouse, the last one being issued in 2018.